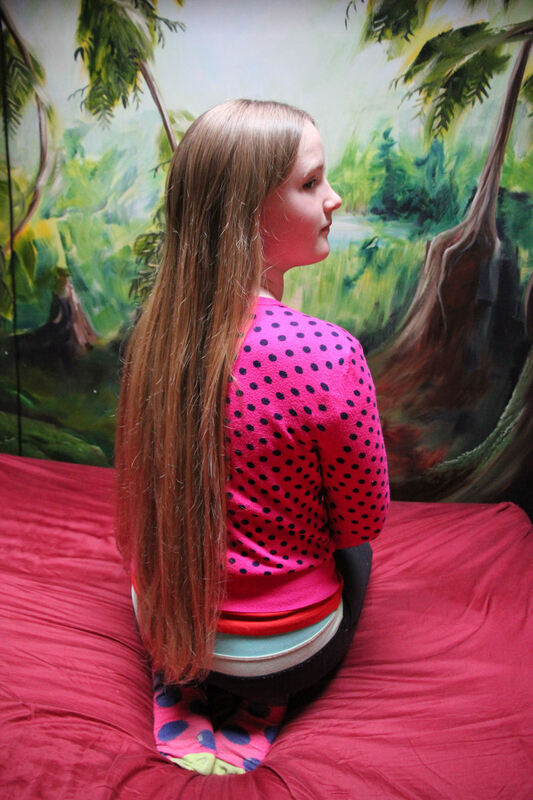 Rhiannon has been growing her hair her whole life long. 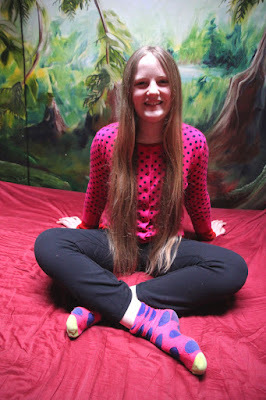 When she was around 5 or 6 her plan was to grow it down to her feet, cut it off and keep it, grow it out again, and then attach the first length to the end of the new floor-length hair to wear as a train for her wedding. Then the daughter of a friend of mine went through and recovered from leukemia, and eventually Rhiannon's plans changed. 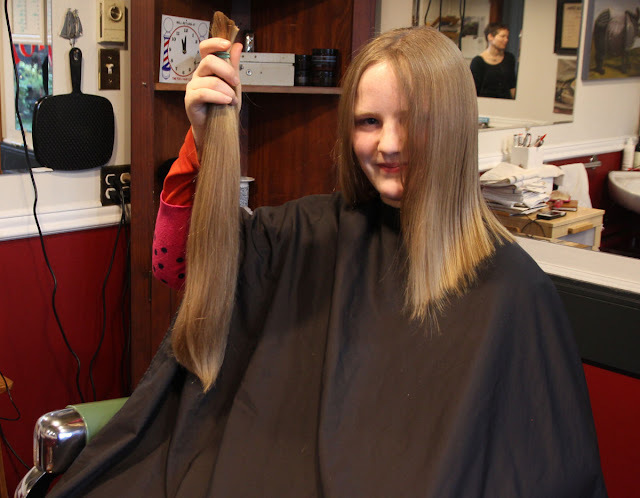 She decided to grow her hair very long and donate it to make a wig for a child with cancer. We haven't been able to find an organization who can specify that it goes to a child, so she's had to settle for an anonymous (and anonymous-aged) recipient, but today she finally made the cut! 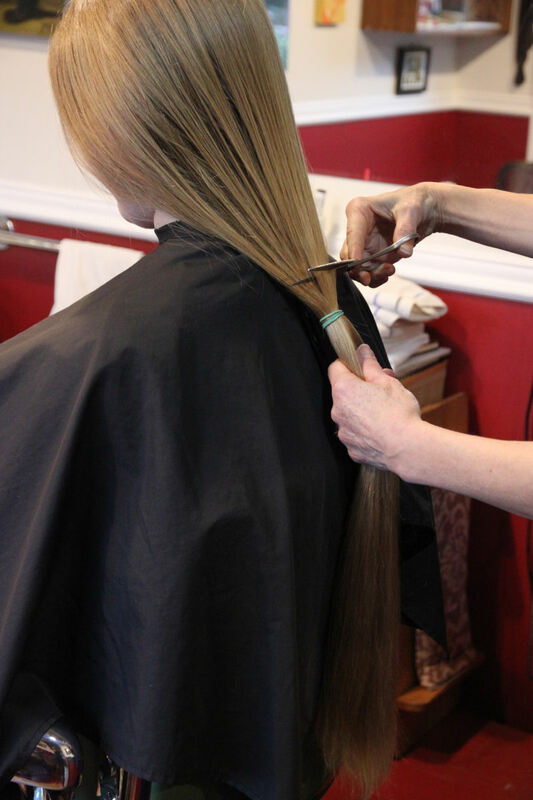 She now has a 19-inch-long ponytail lying waiting to mail away! Ta Da! 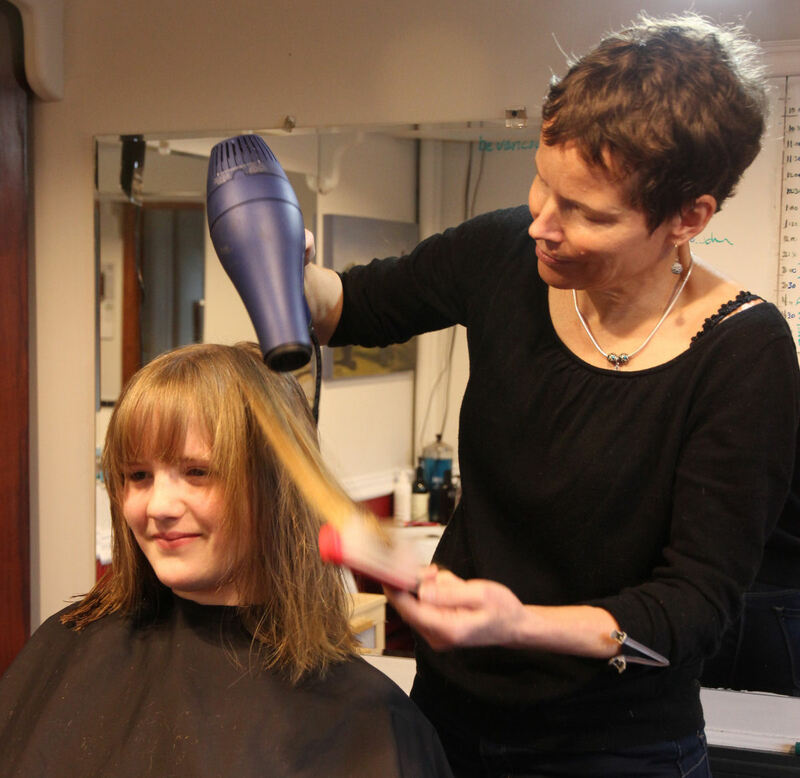 She loved her first hairdresser experience with Jeanette, she loves her new style, and she loves that she feels so light and free! My daughter's class is doing a BC history unit, and I am grateful to be involved with it. This week they've been looking into some of our local logging history, and have even had my mother, Lyn, in to sing some relevant BC songs with them, as she has been doing for many lucky children since before I was old enough even to go to school, myself. 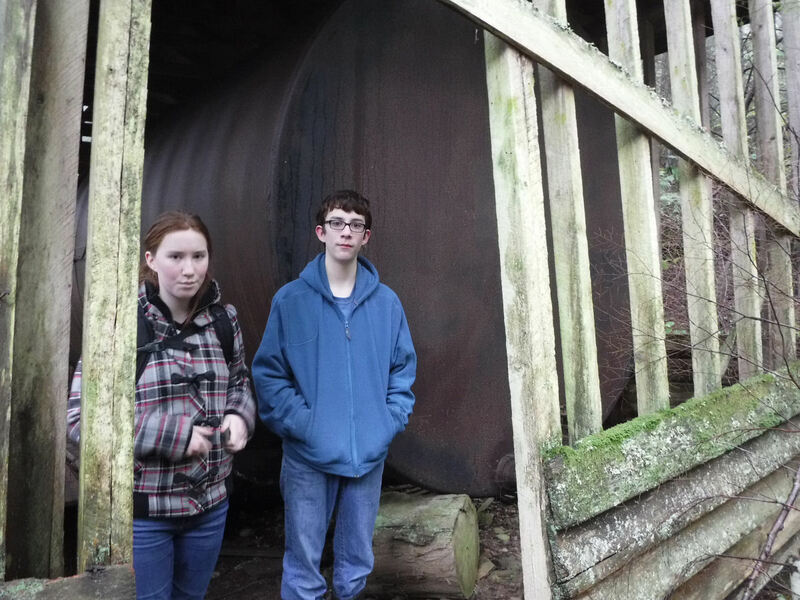 And then we went out to explore our local logging heritage, too! 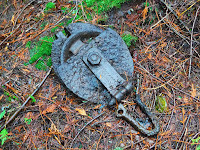 On the slope of the mountain we found remnants of a steam donkey and its rigging. We took the opportunity to sing Donkey Riding. As always, some were more enthusiastic than others, but those who had been singing it already with my mother helped greatly to carry the song. And we found so many interesting things! 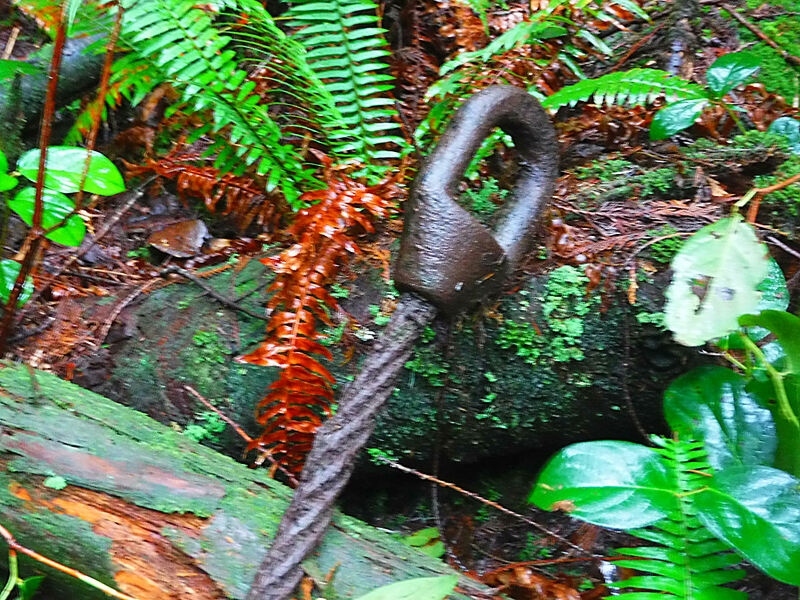 Great cable lies in many pieces here and there along the creek above the donkey's boiler, and one of the blocks from the rigging is slowly decomposing between the tall cedar trees. If it wasn't for the many giant stumps pocked with springboard notches and iron spikes, you might not realize this place was logged within the last century. But it was. And it's a piece of our shared history. We were fortunate, this time, to have the great grandchildren of one of the local loggers in the class group, and they led us on a short hike to see their great grandfather's enormous water tank, which was used as a precautionary measure in case the logging machinery might start a forest fire. (And interestingly, was probably built not long after a great fire devastated the other half of our island - caused, unfortunately, by our long-ago neighbour's slash-pile.) 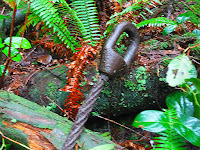 All of this is history, now, having occurred many many decades ago, but to visit and touch and sing about our history brings it all to life again, connects us to it, and means that its lessons are not lost to us. 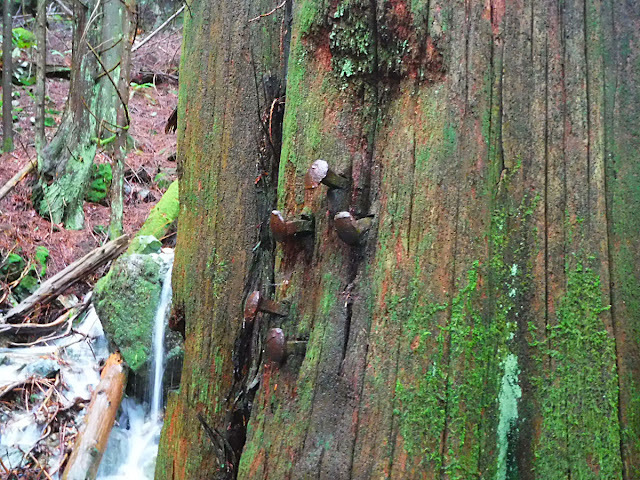 We live in a piece of second-growth west coast rain forest. It is our privilege and responsibility both to know it and to care for it. 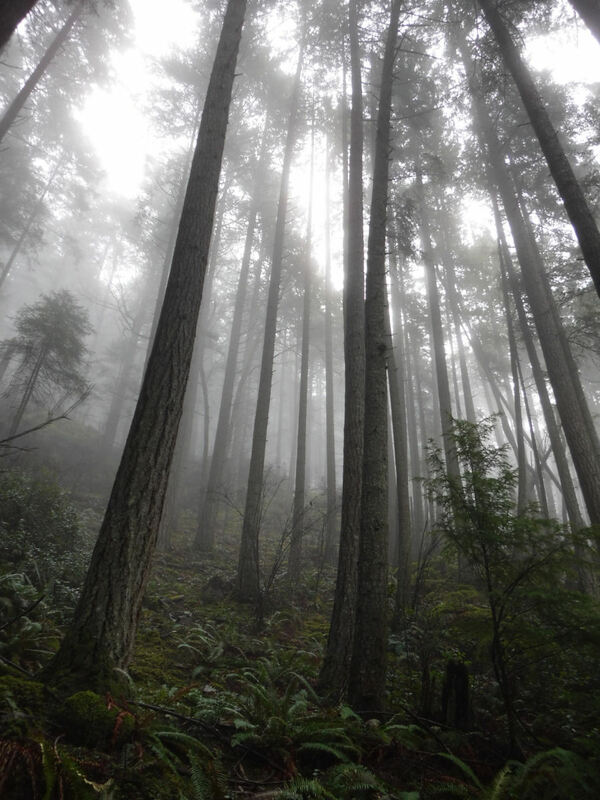 We look up into the forest and see such enormous beauty, but when we get to know it well we begin to see its fragility and its importance in every aspect of our lives, both as a carrier of our own natural and social history, and in its role as our own ecosystem. I think this understanding is one of the most important lessons life has to give us. I live in gratitude every day for living in the place I do, where the gift of the living land is still available to me, and where I can watch other people receive that gift as well. Have you ever visited the lower Mt Gardner mine? If not, now is the time to go! 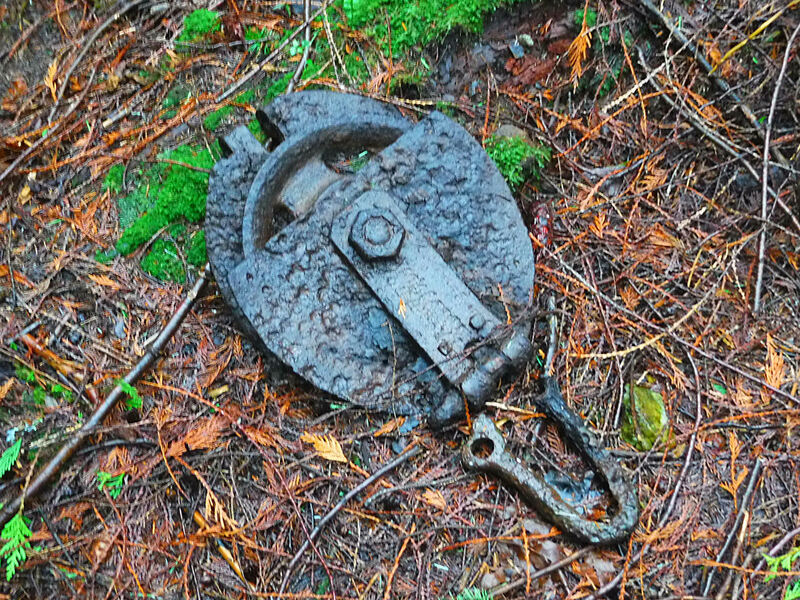 This old mine adit was put in over a century ago, in the pursuit of gold, among other things. unsettling at first, but then just plain yucky in its decomposition, as the years went by. 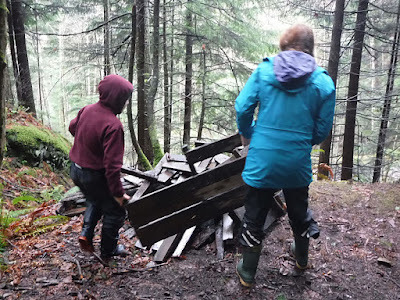 Also, the pallets put in as a makeshift boardwalk over the massive puddle at the entrance have disintegrated, leaving many planks with protruding nails in the deep water. Not pleasant or safe, and the mine's glory days as an education venue have appeared to be behind us, lately. So this week a group of local grade four-to-nine students came and cleaned out the mine. 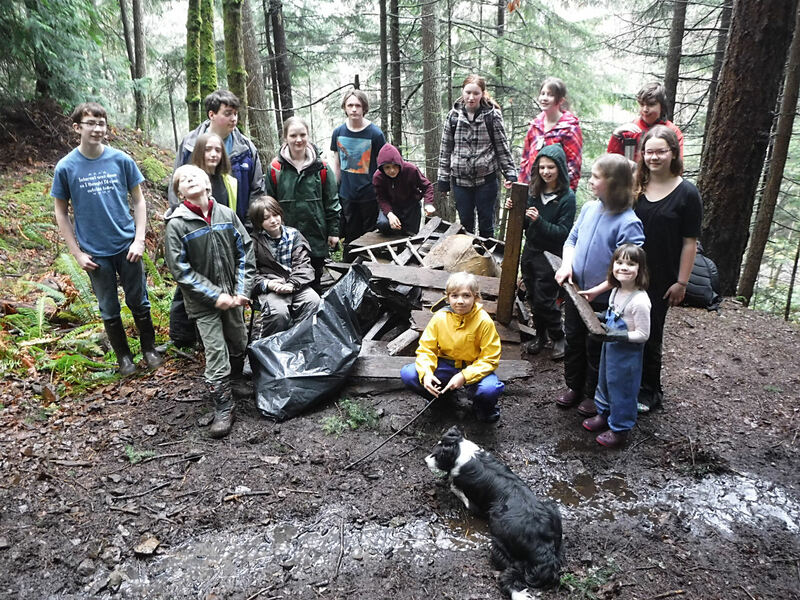 These dedicated and hard-working kids hauled out few hundred pounds of stinky, spiky, soggy wood and rotting clothing, not to mention quite a few slimy candles and other bits of garbage. The reward? Hanging out in the tidied mine adit, of course! We stood around in the complete dark, where we couldn't even see our own hands in front of our faces, and relied on the breathing and shuffling sounds to know where the others were. We experimented with song (The Hard Rock Miner!) 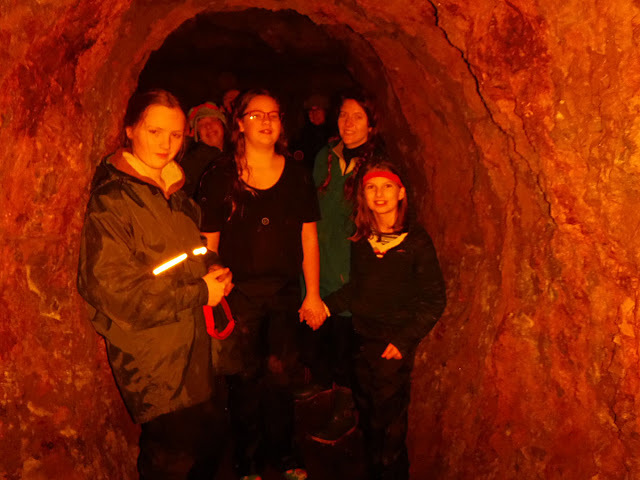 and sound, as we all tried out different vocal and percussive sounds in the wonderfully echoing mine. It seems impossible to get a photo in there but suffice it to say that the rocks are actually varying shades of grey and beige with quartz bits here and there, as opposed to this brilliant orange colour! But that wasn't the end of it! 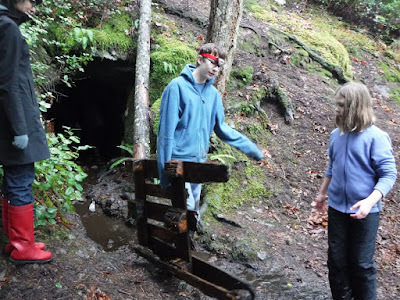 Once they'd cleaned out and thoroughly explored the mine adit, the kids decided they could go one step further and drain off some of that giant puddle at the entrance to the mine. The water already flowed out onto the trail, so they worked to improve the flow and to direct it off of the trail as soon as possible. Then they went up and cleared a path to drain the smaller mine above, as well. Draining the smallest mine adit (video). When I was young my father organized a group of locals to build the trails on our beloved Mt Gardner, and I think those people can be quite proud of the gift they gave our community. By comparison this act of stewardship was small, but these kids can nevertheless be pleased with themselves. It's these small gestures that make us part of our community; part of our own local ecology. 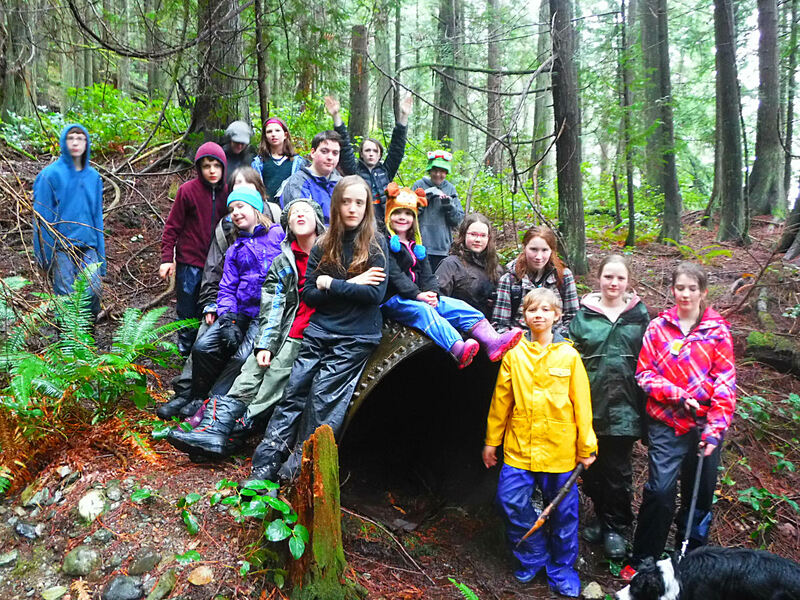 These kids have cleared the way for many more groups to come exploring and to get familiar with the treasures of our own local and natural history. Earth Day Every Day is a bi-monthly series of essays I write for the Bowen Bulletin, re-published here for fun! Last Earth Day I committed to carry on walking through the wilderness regularly, and report back here as the year went by. Well, it's February, spring is here again! It's not the spring of daffodils and tulips, yet; not of bees and bare feet and warm grassy hillsides. It's not even the spring of March storms and robins appearing on lawns. No. This is the more subtle, early spring. This is the spring of tiny skunk cabbage shoots appearing from the mud below the water's surface in the flooded forest. It's the spring of cold grey branches just beginning to plump up and push lumps forth that will soon become buds. It's the uncomfortable feeling of discovering you've worn too many clothes, as walking through the woods into sunlight has warmed you beyond what you planned for, and then the chill as the sun suddenly drops behind the trees and it's still mid afternoon. This is the time of year some of us like to curl up with our seed catalogues, but outside on the forest floors the seeds do not wait for us. Even quite a long way from maple trees, maple seeds are popping cotyledons up like green candies among the brown rotten leaves and crumbled bark. Grass and annual flower seeds, recently frozen in the meadow's crunchy surface, are swelling with the squishy soil as the creek breaches its banks and floods the meadow trails. Soon the dull green of the winter grasses will be enriched by a growing charteuse from underneath. Everywhere, green is pushing brilliance through the din. This is the season when shoots seem to spring from the ground, and we understand the meaning of the word Spring. Everything is taking a great big leap into action. Have you heard of the Leap Manifesto? In the briefest terms, it is “a call for an economy based on caring for the earth and one another.” This is a leap year – a time to extend our calendar to align ourselves with the earth's schedule. It can also be an opportunity to extend our minds and actions – to leap forward into a new way of living. I've been writing this Earth Day Every Day series for almost a year. This is the final piece before I begin a new series in April. Next time you hear from me we'll be into the big, intense, no-holds-barred, hang-out-every-flashy-flower-you've-got kind of spring. So here's our opportunity to leap into it. For ten months now I've been taking walks by myself and sharing my thoughts with you. Now I'd like to leap. LEAP, I say! Seriously – it's getting a little late in the game for my lovely, personal, but not-so-far-reaching little wanders, and thinking about Nature. Yes, it matters what I do. Yes, it makes a difference and the more we all do it, the more connected we all become, and the more we understand the place we live, the community (built and natural) that we are a part of, and the changes we can make by being aware. But I feel like we need to do more. Not something else. More. As in keep walking out on our land and exploring, but also bring others with us. Also make big changes in our lives. Eight years ago we took a huge leap and pulled our son out of school, completely. We hesitated for ages mostly because I was afraid of telling the teachers, but when I finally did, they congratulated me. Then we took another huge leap and told our very concerned parents and friends that we intended to unschool them – to give them a rich and fulfilling life but to have no agenda whatsoever for their academic futures. No curriculum, no classes. Just life. We were told it was impossible; maybe illegal, even (it's not). 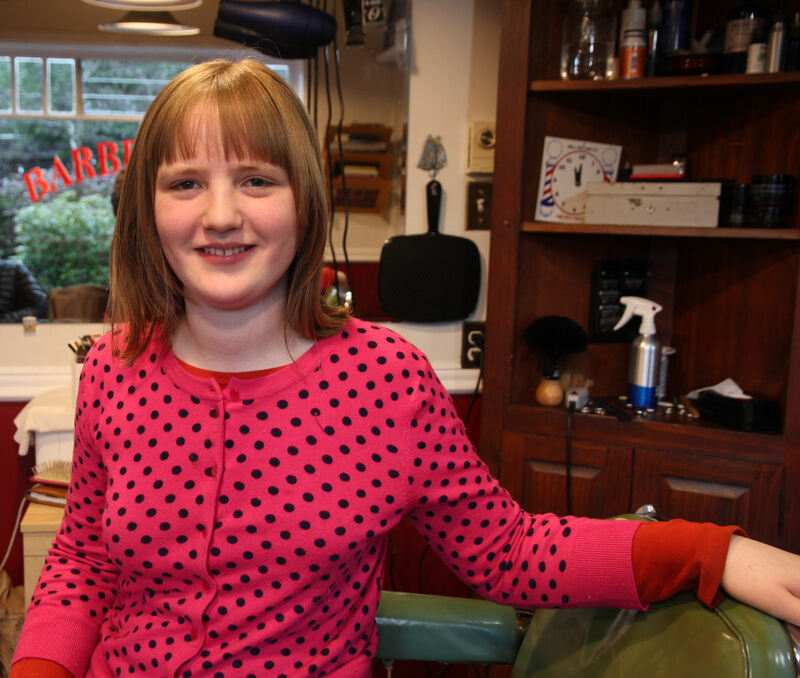 We were told it would harm our children and that it was irresponsible. It was one of the most difficult decisions I've ever made, and definitely the most controversial. I was terrified. But it turned out to be a fabulous choice for my children and for our family. We leapt wholeheartedly in, spending lots of time running around in the literal and proverbial wilderness and seeing where we would end up. 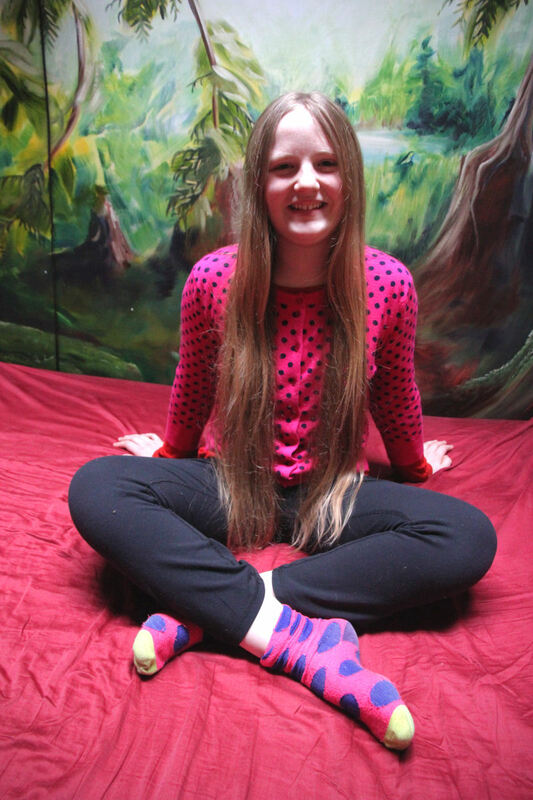 We unschooled entirely until our first child reached grade seven and wanted more regular social interaction. Then we continued to hold onto our open and free-range parenting principles as he navigated the new-to-him adventure of school. That was a leap, too. Sometimes you just have to go running as fast as you can, and leap without holding on. I think it's time to do that again. I am not sure where the next leap will take us, but it's going to have to make a difference in our world.